It’s not my data connection has been dropped, it is the connection between RT-AC51U and C3. 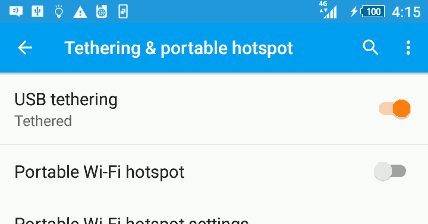 I am sure because if I manually disable data connection on C3, USB Tethering is still enabled. Therefore, I assume the problem is about USB Tethering rather than data connection on C3. Interesting, I cannot check the “Data Usage” in Settings after data connection begins to drop frequently. It always crashes the Settings App. Reboot my C3 doesn’t help. Wonder if someone has hacked to my device and block me from checking “Data Usage” to detect uncommon internet access. To find out what’s going on, I uninstall every download apps and disable build-in app one by one. Strangely, C3 reboots itself every time after uninstalling or disabling an app and I have never being about to check my “Data Usage“. Eventually, I decide to reset. Guess what, the USB Tethering never drops again within 5 days. I cannot solve my problem and seems reset is the only work around available. Update on 2017/5/25: I finally realize it’s due to the limited storage to keep data usage logs after upgrading to Android 5.x. If you have root access, delete these log and everything goes back normally. Remember to check it regularly.